The FAIR test is a sensitive and specific test for detection if irritation of the sciatic nerve by the piriformis. FAIR stands for flexion, adduction and internal rotation. Also known as piriformis test. The piriformis is a flat muscle and the most superficial muscle of the deep gluteal muscles. It is part of the lateral rotators of the hip (obturator internus, superior and inferior gemelli, quadratus femoris, obturator externus, and gluteus maximus). It leaves the pelvis through the greater sciatic notch, until its fixation reaches the superior margin of the greater trochanter. It has a piramidal shape that lies almost parallel with the posterior margin of the gluteus medius. The piriformis muscle can be used to locate the scietic nerve. This nerve enters the gluteal region inferiorly to the piriformis.If the lateral rotators of the hip are tight they may exert pressure on the sciatic nerve, producing pain radiating into the lower extremity.This is known as Piriformis Syndrome. For more detailed information on the anatomy of the piriformis muscle. A: Usual relationships with the sciatic nerve passing from the pelvis beneath m. piriformis. B: M. piriformis divided into two parts with the peroneal division of the sciatic nerve passing between the two parts of piriformis. 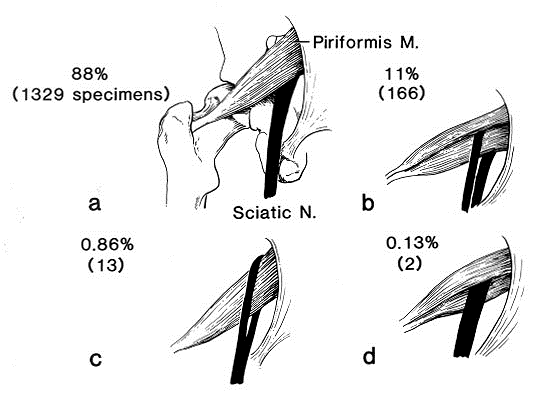 C: The peroneal division of the sciatic nerve passes over m. piriformis and the tibial division passes beneath the undivided muscle. D: In these cases, the entire nerve passes through the divided m. piriformis. Position the patient in the side-lying with the tested hip on top. Passively move the patient's lower extremity into flexion (90 degrees), adduction, and internal rotation. The examiner stabilizes the hip and applies downward pressure to the knee to internally rotate and adduct the hip,  thus placing the piriformis on a stretch that compresses the sciatic nerve. A positive test occurs when pain is produced in the sciatic/gluteal area. Due to the position of the test, pain may produced in the anterior thigh as well as a result of femoral acetabular impingement, so it is important to ask where they are feeling the pain. The FAIR test can be performed with the patient supine or seated, knee and hip flexed, and hip medially rotated, while the patient resists examiner attempts to externally rotate and abduct the hip. Sciatic nerve pain can originate from several factors which include; a disc herniation, sacroiliac joint dysfunction, degenerative joint disease, a tight piriformis, and more. If you suspecting a patient's neural symptoms to be originating from tightness of the piriformis muscle, the FAIR test may be used to help strengthen your hypothesis. According to Neumann, the piriformis originates at the ventral surface of the sacrum and runs through the greater sciatic foramen to insert on the superior part of the greater trochanter, leading to the actions of hip external rotation, abduction, potentially slight extension (due to the posterior to anterior line of pull). The position of flexion, adduction, and internal rotation places a stretch on the piriformis muscle and, theoritically, compressing the sciatic nerve. Additionally, a ROM assessment, palpation skills, and movement analysis would be very beneficial in your physical examination to help confirm your hypothesis. ("Piriformis syndrome: Diagnosis, treatment and outcome- a 10-year study," "Unilateral limitation of abduction of the hip: A valuable clinical sign for DDH?"). ↑ 1.0 1.1 Oatis, C. A., (2009). Kinesiology : the mechanics and pathomechanics of human movement (2nd ed). Baltimore : Lippincott Williams & Wilkins. ↑ Piriformis. (2017, June 6). Physiopedia, . Retrieved 09:52, December 15, 2017 from https://www.physio-pedia.com/index.php?title=Piriformis&oldid=174010. ↑ Lori A, Boyajian- O’ Neill et al. Diagnosis and Management of Piriformis syndrome : an osteopathic approach. The journal of the American and osteopathic association Nov 2008; 108(11): 657-664. ↑ Pace JB, Nagle D. Piriformis syndrome. West J Med. 1976; 124: 435-439. ↑ Benzon HT, Katz JA, Benzon HA, Iqbal MS. Piriformis syndrome: anatomic considerations, a new injection technique and a review of the literature. Anesthesiology. 2003; 98: 1442-1448. ↑ 11.0 11.1 11.2 Fishman LM, Dombi GW, Michaelsen C, Ringel S, Rozbruch J, Rosner B, et al. Piriformis syndrome: diagnosis, treatment and outcome- a 10 year study (review) Arch Phys Med Rehabil. 2002; 83: 295-301. ↑ Neumann, Donald. Kinesiology of the Musculoskeletal System: Foundations for Rehabilitation. 2nd edition. St. Louis, MO: Mosby Elsevier, 2010. 498. Print. ↑ Jari S, Paton RW, Srinivasan MS. "Unilateral limitation of abduction of the hip: A valuable clinical sign for DDH?" J Bone Joint Surg2002; 84-B: 104-107. Web. 08/25/2012.